Cup final goalscorer Peter Grant came to the fore again wiuth the winner in this League Cup clash at Firhill. A scrappy, nervy first half saw only two shots on goal both from the Bairns and one bringing a goal. Grant stabbed in a John Baird cross on the half-hour to open the scoring with the first shot on target of the match. David Smith followed it up with an effort straight at Tomas Cerny two minutes later. Until that point it had been a tousy midfield scrap, with both sides looking over-eager and rushed. Thistle piled pressure on Falkirk’s backline but defending, by any and every means necessary kept the home side at bay. It wasn’t particularly elegant but it was effective. All Danny Rogers had to do was gather a few low crosses, but it was uncomfortable for the Bairns nonetheless. 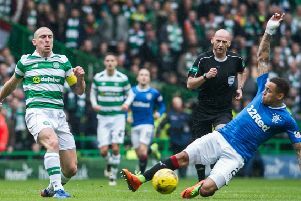 They had good fortune too when Ryan Stevenson broke free but his passage into the box was blocked by paul Watson, and Craig Thomson waved play on without even calling a foul, nevermind showing a card. Watson had also stemmed a anopther Thistle break earlier with a great tackle on Amoo who was substituted at half-time. His replacement, Mathias Pogba, had a grreat chance to level by breaking forward, nipping away from Watson and luring Danny Rogers from his line. The Frenchman took the ball wide of the goalkeeper, but retreating Bairns cluttered the goalmouth and his shot, eventually, was blocked by Rogers’ recovery. Still the Bairns defended in any way they could. Booting the ball high into the Glasgow night sky when necessary but playing with significantly more purpose than Partick Thistle. Pogba’s was the only real chance for the Jags in the second half and the Bairns held out, running down the clock where they could and Will Vaulks and Peter Grant both picked up cautions for time-wasting from ref Craig Thomson as the seconds ticked down.